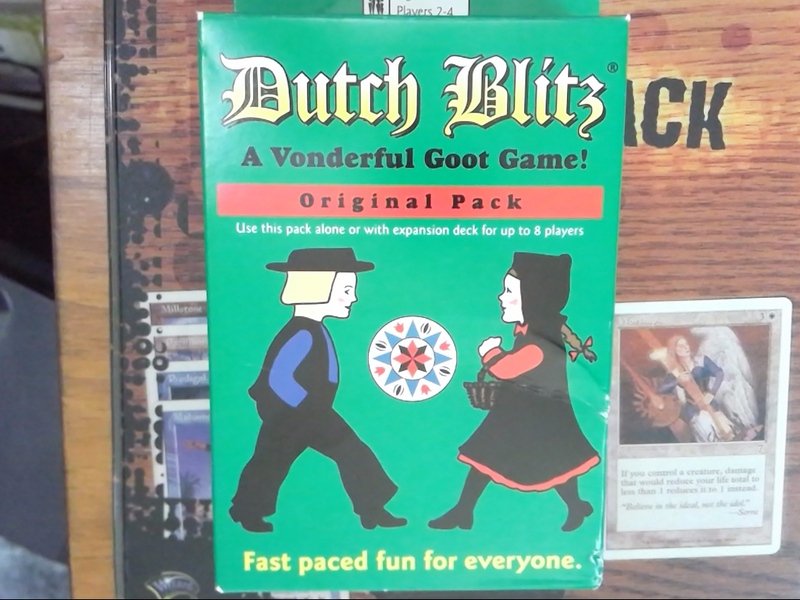 Dutch Blitz has four decks of cards with 40 cards in each deck. The game can be played with two, three or four players. Each deck of cards has a different picture/design on it: plow, pail, carriage and pump. Each player chooses a deck with their preferred design and keeps it throughout the game no matter how many hands are played. The card decks also have separate colors: yellow, blue, red and green on their fronts. 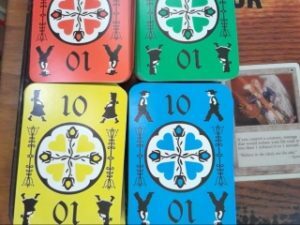 On the red and blue cards is the Pennsylvania Dutch Boy picture. The yellow and green cards have the Pennsylvanian Dutch Girl picture. Players will build three basic groups of card in front of them to use during the game. Then each of you deal yourself the next ten cards and place them face up in a pile to your right. This will be your “Blitz Pile” and you should line it up with the Post Pile. Each of you then hold the remaining cards from your deck in your hands. You are ready to start playing. NOTE: If there are only two of you playing, the Dutch Blitz Rules are the same except for the Post Piles should have five cards in them instead of three. To start each player puts out three cards face up in front of them to create a Post Pile. Each player then creates a stack of ten cards face up with only the top card showing and places these next to their Post Pile. This stack of ten cards is called the Blitz Pile. The remaining cards from the deck are held face down. All players go at the same time and try to empty their Blitz Pile. If there is a one on the top of any face up stack, play it to the center of the table to begin a “Dutch Pile.” When a two of the same color as the one appears it is placed on top of the one. All cards on a Dutch Pile are played to the next higher number and must be the same color. Players can also play from the Blitz Pile onto a Post Pile and from one Post Pile onto another only if the numbers decrease in order and the boys and girls alternate. If you can’t play a card, reveal a card from the stack in your hand by counting them out in groups of three and laying them face up revealing only the top card. You can play the top card onto a Dutch Pile or Post Pile as long as you follow the Dutch Blitz Rules. Once you empty your Blitz Pile the round ends. 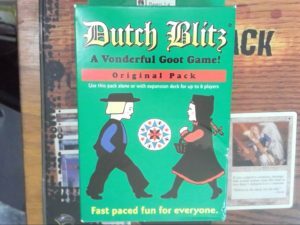 Players score one point for each of the cards in their Dutch Pile, and lose two points for each card left in their Blitz Pile. All players then sort the cards and play again. When one player reaches the score of 75 the game ends and the player who reached 75 first is the winner. Wood Pile: these are the cards kept to the right of the player and are built up. Ditch Pile: different stacks of cards in four different colors in numbers 1-10. These are placed in the middle of the table and played upon by all players. Each player gains scoring points here toward final game. Post Piles: Collection of cards placed to the left of both the Blitz and Wood Piles and the players. This is the replacement or trading area during the game. Blitz Pile: This is the most important pile of cards in the game as it the key towards Blitzing. It is a pile of ten cards placed to the left or right side depending on which handed the player is. If a player makes a mistake and any other player notices, they should call out “Dutch!” All play has to immediately stop without disturbing any cards. The cards played incorrectly are returned to their original positions and the game continues. General Dutch Blitz Rules are that you cannot pick up more than one card during the play from any of your card piles. Cards must be placed onto the Dutch Pile, not thrown. Only one hand can be used to play and no alternating between hands. Dutch Piles can only be started with a number one card. Blitz Pile must be played from the top card. Post Pile must be built in decreasing and alternate order between the Dutch girl and the Dutch boy. Wood Pile must be played from the top and cannot be shuffled. Cards in your hand can only be turned over in sets of three and cannot be shuffled. Cards must also be taken from the top, never from the bottom.